This veggie is not only delicious to eat, but as a bold, silver-foliaged, strongly architectural plant, is a handsome addition to your ornamental garden. The globe artichoke is an herbaceous perennial, which produces flower buds for up to five years. It regularly replicates itself, thus ensuring a continuous supply of edible, green, sometimes purple-flushed, flower buds with many overlapping bracts. The average bud weighs from 200 to 300g, and if not harvested produces a striking, violet-blue flower head towering around a metre, or more, above the plant. 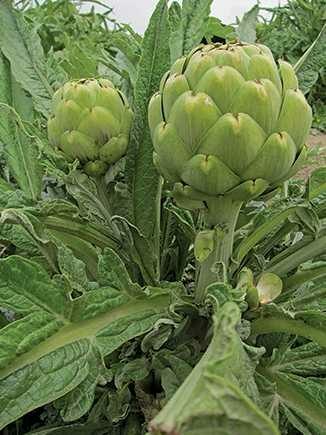 Globe artichokes grow well from seed sown on site in spring (after danger of frost is over), but you can also create new plants from the rooted side shoots that the plant produces. Pick these from the parent plant when about 25cm high and give them a good-sized growing space – they need an area about a metre wide. They are a deep-rooting plant, growing best in free-draining, light, friable soil, and like a sunny, sheltered site. Globe artichokes are not frost hardy, and during winter the tops die down – regeneration occurs in spring. Although the plant withstands dry conditions, regular watering will ensure even plant growth. You’ll get the best flower buds for eating if you give them plenty of moisture, as well as fertility. Harvest the immature flower heads before the bracts open up – usually 70-80 days after planting. Taking out the initial and main flower head encourages the plant to branch out and form new flowers. You can continue harvesting through summer, but to maintain vigour and health you need to maintain soil moisture and fertility. In autumn, cut the plant well back to three or four main strong shoots, and mulch for winter protection. Globe artichokes remain vigorous for about three to five years, so organise your replacements to ensure an ongoing supply. ‘Green Globe Improved’ has rich deep green buds, and is a vigorous, prolific plant which grows to a height of one metre. The plant will produce the first year from seed, but they are usually better when cut back and carried over to the second year. ‘Imperial Star’ produces buds early, and is widely grown commercially. Usually around six to eight buds will form (about ten cm across) on a bushy plant. ‘Purple de Jesi’ has green, medium to large flower buds with purple-tinged petals that can be eaten raw when the heads are young and tender. 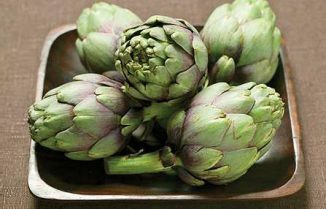 When preparing artichokes you need to strip off the tough outer leaves, then rub with lemon juice to stop discolouration. Steam or boil for 20-25 minutes, or microwave for about seven, depending on size, until lower scales pull away easily from base. The fleshy base of the petals and the meaty heart are the most edible parts – they are simply delicious.